王铁晖, 巩恩普, 陈晓红, 崔莹, 高飞, 黄文韬. 辽西地区早白垩世义县组大康堡层沉积特征及沉积环境演化[J]. 地质通报, 2018, 37(6): 1166-1175. 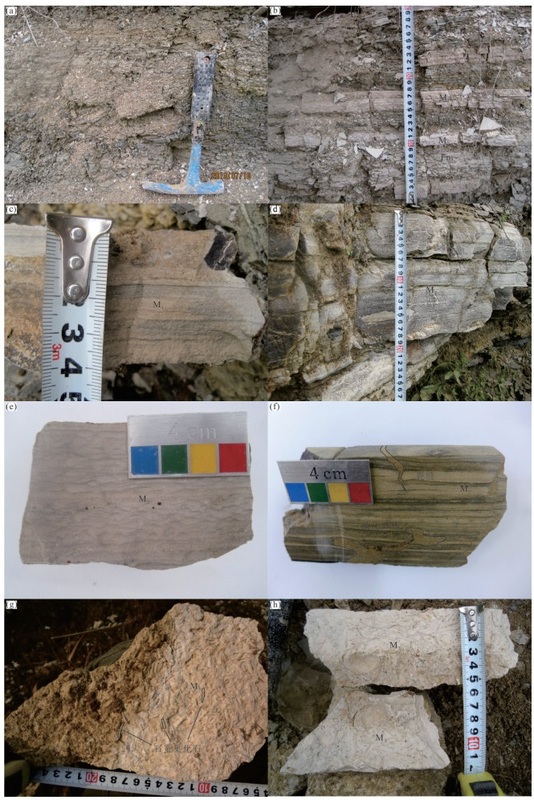 Wang T H, Gong E P, Chen X H, Cui Y, Gao F, Huang W T. Sedimentary characteristics and environmental evolution of Da-kangpu layer of Early Cretaceous Yixian Formation in western Liaoning[J]. 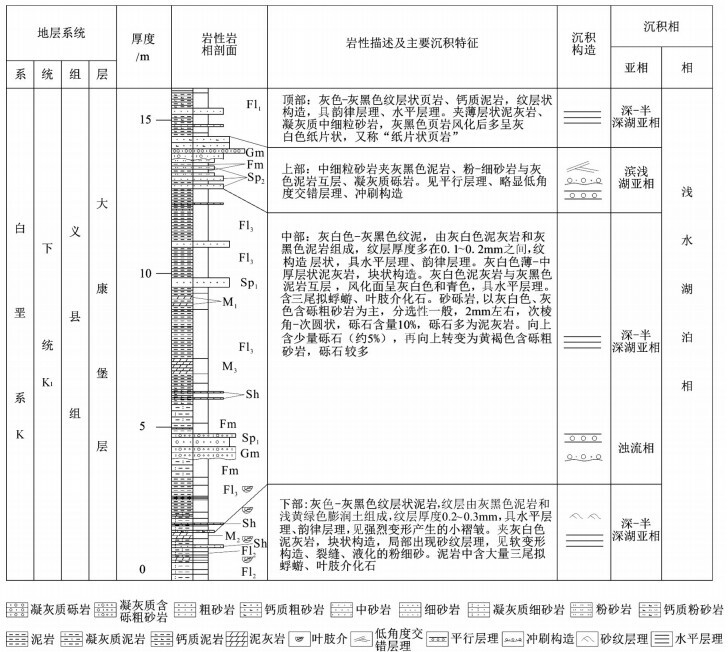 Geological Bulletin of China, 2018, 37(6): 1166-1175. Abstract: Widely distributed in Yixian Basin in western Liaoning, Dakangpu layer of the Yixian Formation belongs to Lower Creta-ceou and is an important horizon of "Jehol Biota". A typical section was measured in detail for sedimentology and 11 lithofacies types were recognized, such as matrix supported conglomerate facies, tuffaceous medium-coarse grained sandstone facies and medium-fine grained sandstone facies with parallel bedding. Dakangpu layer comprises mainly lacustrine sediments including shore shallow lake fa-cies and deep and semi-deep lake facies. Based on analyzing the changes of vertical sequence characteristics and varves characteristics of Dakangpu layer, the authors divided it into four depositional stages. At the initial stage, the lake was just formed with a large num-ber of shallow water fossils. After that it entered into the middle-range stage with deep and semi-deep water in the relatively closed and semi-closed state, during which the salinity increased. In the late depositional stage, the lake became shallow with higher hydrodynamic condition and low salinity. At the end of the deposition the lake had deep and semi-deep water, and the varves were devel-oped which indicated poor terrigenous clast and little precipitation. The evolution of the lake was controlled by paleoclimate obviously. Hou L H, Zhou Z H, Martin L D, et al. A beaked bird from the Jurassic of China[J]. Nature, 1995, 377: 616–618. DOI:10.1038/377616a0. 季强, 姬书安. 原始祖鸟(Protarchaeopteryx gen. nov.)——中国的始祖鸟类化石[J]. 地质科技情报, 1997, 3: 38–41. 汪筱林, 王元青, 王原, 等. 辽西四合屯及周边地区义县组下部地层层序与脊椎动物化石层位[J]. 古脊椎动物学报, 1998, 36: 81–101. 王五力, 张立君, 郑少林, 等. 义县-北票地区义县阶标准地层剖面及其生物地层学新研究——义县阶标准地层剖面建立和研究之二[J]. 地质学报, 2004, 78(4): 433–447. 丁秋红, 张立东, 郭胜哲, 等. 辽西北票地区义县组古气候环境标志及其意义[J]. 地质通报, 2003, 22(3): 186–191. 郑少林, 郑月娟, 邢德和. 辽西晚侏罗世义县组植物群性质、时代及气候[J]. 地层学杂志, 2001, 27(3): 233–241. 巩恩普, 梁俊红, 李小冬, 等. 辽西早白垩世早期热河生物群沉积环境及古地理综合研究[J]. 地质学报, 2007, 81(1): 1–8. 梁俊红, 巩恩普, 陈登辉, 等. 辽西义县盆地英窝山下白垩统义县组砖城子层沉积岩石组合特征及古环境研究[J]. 沉积学报, 2011, 29(1): 14–22. Jiang B Y, Sha J G. Preliminary analysis of the depositional environments of the Lower Cretaceous Yixian Formation in the Sihetun area, western Liaoning, China[J]. Cretaceous Research, 2007, 28(2): 183–193. DOI:10.1016/j.cretres.2006.05.010. 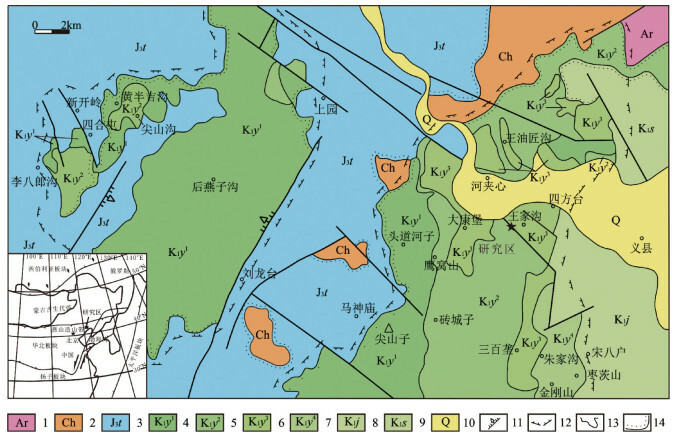 Jiang B Y, Fürsich F T, Hethke M. Depositional evolution of the Early Cretaceous Sihetun Lake and implications for regional climatic and volcanic history in western Liaoning, NE China[J]. Sedimentary Geology, 2012, 257/260: 31–44. DOI:10.1016/j.sedgeo.2012.02.007. 王五力, 张宏, 张立君, 等. 土城子阶、义县阶标准地层剖面及古生物、构造-火山作用[M]. 北京: 地质出版社, 2004: 311-327. 张立东, 郭胜哲, 张长捷, 等. 北票-义县地区义县组火山构造及其与化石沉积层的关系[J]. 地球学报, 2004, 25(6): 639–646. 王根厚, 张长厚, 王果胜, 等. 辽西地区中生代构造格局及其形成演化[J]. 现代地质, 2001, 15(1): 1–7. Kenneth J H. Physics of Sedimentology-Textbook and Reference(second edition)[M]. Berlin; New York: Springer, 2004: 118-119. Hülya A, Baki V, Özkul M. Sedimentary facies, depositional environments and palaeogeographic evolution of the Neogene Denizli Basin, SW Anatolia, Turkey[J]. Sedimentary Geology, 2007, 202(4): 596–637. DOI:10.1016/j.sedgeo.2007.06.002. Turkmen I, Aksoy E, Tasgin C K. Alluvial and lacustrine facies in an extensional basin:The Miocene of Malatya basin, eastern Turkey[J]. Journal Of Asian Earth Sciences, 2007, 30(1): 181–198. DOI:10.1016/j.jseaes.2006.08.006. De G G. Greochronologie der letzten 12000 Jahre[J]. Geologische Rundschau, 1912, 3(7): 457–471. DOI:10.1007/BF01802565. Czymzik M, Dulski P, Plessen B, et al. A 450 year record of spring-summer flood layers in annually laminated sediments from Lake Ammersee (southern Germany)[J]. Water Resources Research, 2010, 46: W11528. Leonard E M. The relationship between glacial activity and sediment production:evidence from a 4450-year varve record of neoglacial sedimentation in Hector Lake, Alberta, Canada[J]. Journal of Paleolimnology, 1997, 17(3): 319–330. Martin P C, Brauer A, Dulski P, et al. Testing climateeproxy stationarity throughout the Holocene:an example from the varved sediments of Lake Meerfelder Maar (Germany)[J]. Quaternary Science Reviews, 2012, 58: 56–65. DOI:10.1016/j.quascirev.2012.10.023. Czymzik M, Brauer A, Dulski P, et al. Orbital and solar forcing of shifts in Mid to Late Holocene flood intensity from varved sediments of pre-alpine Lake Ammersee (southern Germany)[J]. Quaternary Science Reviews, 2013, 61: 96–110. DOI:10.1016/j.quascirev.2012.11.010. Corella J P, Benito G, Rodriguez L X, et al. Annually-resolved lake record of extreme hydro-meteorological events since AD 1347 in NE Iberian Peninsula[J]. Quaternary Science Reviews, 2014, 93: 77–90. DOI:10.1016/j.quascirev.2014.03.020. Zolitschka B, Francus P, Ojala, A E K, et al. Varves in lake sediments-a review[J]. Quaternary Science Reviews, 2015, 117: 1–14. DOI:10.1016/j.quascirev.2015.03.019. Brauer A, Endres C, Günter C, et al. High resolution sediment and vegetation responses to Younger Dryas climate change in varved lake sediments from Meerfelder Maar, Germany[J]. Quaternary Science Reviews, 1999, 18(3): 321–329. DOI:10.1016/S0277-3791(98)00084-5. Brauer A, Haug G H, Dulski P, et al. An abrupt wind shift in west-ern Europe at the onset of the Younger Dryas cold period[J]. Nature Geoscience, 2008, 1: 520–523. DOI:10.1038/ngeo263. Martin P C, Matthes K, Brauer A, et al. Regional atmospheric circulation shifts induced by a grand solar minimum[J]. Nature Geoscience, 2012, 5: 397–401. DOI:10.1038/ngeo1460. 张亮, 王赤, 傅绥燕. 太阳活动与全球气候变化[J]. 空间科学学报, 2011, 31(5): 549–566. DOI:10.11728/cjss2011.05.549. Francus P, Bradley R S, Lewis T, et al. Limnological and sedimentary processes at Sawtooth Lake, Canadian High Arctic, and their influence on varve formation[J]. Journal of Paleolimnology, 2008, 40(3): 963–985. DOI:10.1007/s10933-008-9210-x. 袁慰顺. 膨润土的成因类型与应用方向关系探讨[J]. 中国非金属矿工业导刊, 2011, 5: 1–4. Stockhecke M, Anselmetti F S, Meydan A F, et al. The annual particle cycle in Lake Van (Turkey)[J]. Palaeogeography, Palaeoclimatology, Palaeoecology, 2012, 333/334: 148–159. DOI:10.1016/j.palaeo.2012.03.022. Stockhecke M, Sturm M, Brunner I, et al. Sedimentary evolution and environmental history of Lake Van (Turkey) over the past 600000 years[J]. Sedimentology, 2014, 61(6): 1830–1861. DOI:10.1111/sed.12118. Jean Y G, Abdullah D, Bertrand F, et al. Geochemical behaviour of silia and magnesium during the evaporation of waters in Chad[J]. Chemical Geology, 1997, 19(1/4): 215–228. Zhou A F, Chen F H, Qing M R, et al. The discovery of annually laminated sediments (varves) from shallow Sugan Lake in inland arid China and their paleoclimatic significance[J]. Science in China Series D:Earth Sciences, 2007, 50(8): 1218–1224. DOI:10.1007/s11430-007-0081-1. Francus P, Suchodoletz H V, Dietze M, et al. Varved sediments of Lake Yoa (Ounianga Kebir, Chad) reveal progressive drying of the Sahara during the last 6100 years[J]. Sedimentology, 2013, 60(4): 911–934. DOI:10.1111/j.1365-3091.2012.01370.x. Anadon P, Utrilla R, Vazquez A. Use of charophyte carbonates as proxy indicators of subtle hydrological and chemical changes in marl lakes:example from the Miocene Bicorb Basin, eastern Spain[J]. Sedimentary Geology, 2000, 133: 325–347. DOI:10.1016/S0037-0738(00)00047-6. Shaw J N, Rabenhorst M C. The geomorphology, characteristics, and origin of the freshwater marl sediments in the Great Limestone Valley, Maryland, USA[J]. Catena, 1997, 30(1): 41–59. DOI:10.1016/S0341-8162(97)00005-2. Street P F A, Hales P E, Perrott R A, et al. Late Quaternary palaeolimnology of a tropical marl lake:Wallywash Great Pond, Jamaica[J]. Journal of Paleolimnology, 1993, 9(1): 3–22. DOI:10.1007/BF00680032. Ojala A E K, Francus P, Zolitschka B, et al. 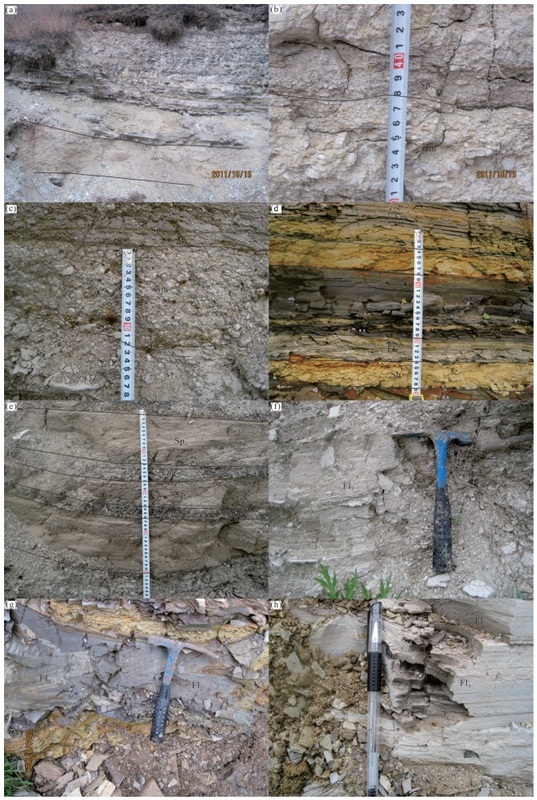 Characteristics of sedimentary varve chronologies-A review[J]. Quaternary Science Re-views, 2012, 43: 45–60. DOI:10.1016/j.quascirev.2012.04.006. 王思恩. 热河生物群的沉积环境-冀北、辽西叶肢介群落古生态与古环境重建[J]. 地质学报, 1999, 73(4): 289–301. Lia C L, Ismar de S C. Cretaceous conchostracans from Potiguar Basin (northeast Brazil):relationships with West African conchostracan faunas and palaeoecological inferences[J]. Cretaceous Research, 2002, 23(3): 351–362. DOI:10.1006/cres.2002.1007. Rohn R, Shen Y B, Dias B D. A new Coniacian-Santonian con-chostracan genus from the Bauru Group, south-east Brasil:taxonomy, palaeobiogeography and palaeoecology[J]. Cretaceous Research, 2005, 26(4): 581–592. DOI:10.1016/j.cretres.2005.02.007. Wolfgang V, Oscar F G, Nora G C, et al. Stratigraphy, palynology, and conchostracans of a Lower Cretaceous sequence at the Canadon Calcareo locality, Extra-Andean central Patagonia:ageand palaeoenvironmental significance[J]. Cretaceous Research, 2009, 30(1): 270–282. DOI:10.1016/j.cretres.2008.07.010. Fürsich F T, Sha J G, Jiang B Y, et al. High resolution palaeoecological and taphonomic analysis of Early Cretaceous lake biota from western Liaoning(NEChina)[J]. Palaeogeography, Palaeoclimatology, Palaeoecology, 2007, 253(3/4): 434–457. Smith G A. Coarse-grained nonmarine volcaniclastic sediments:terminology and depositional process[J]. Geological Society of America, Bulletin, 1986, 97(1): 1–10. DOI:10.1130/0016-7606(1986)97<1:CNVSTA>2.0.CO;2. Jiang B Y, Franz T F, Sha J G, et al. Early Cretaceous volcanism and its impact on fossil preservation in Western Liaoning, NE China[J]. Palaeogeography, Palaeoclimatology, Palaeoecology, 2011, 302(3/4): 255–269. 陈登辉, 巩恩普, 梁俊红, 等. 辽西上白垩统义县组湖相碳酸盐岩碳氧稳定同位素组成及其沉积环境[J]. 地质学报, 2011, 85(6): 987–922. Amiot R, Wang X, Zhou Z H, et al. Oxygen isotopes of East Asian dinosaurs reveal exceptionally cold Early Cretaceous climates[J]. Proceedings of the National Academy of Sciences of the United States of America, 2011, 108(13): 5179–5183. DOI:10.1073/pnas.1011369108.